These medical professionals conduct health exams, give vaccinations, draw blood, prescribe medications, clean and suture wounds, take ultrasounds and x-rays, and perform surgeries. Other duties may include monitoring the reproductive health of the breeding stock, performing artificial inseminations, assisting with problem births, and conducting pre-purchase exams. Large animal veterinarians frequently work long hours and spend a great deal of time on the road as they travel from farm to farm. They also must be on call for potential emergencies on weekends and holidays. The work itself can be particularly demanding for large animal vets, as they must be capable of restraining and treating animals of substantial size. The vast majority of veterinary practitioners work on small animals, such as pets like cats and dogs. According to the American Veterinary Medical Association (AVMA), more than 75 percent of these vets work in private practice. And a small percentage, about 10 percent, work on exotic pets such as snakes and lizards. While most large animal vets work on a variety of livestock species, some choose to focus on offering services exclusively for equine, bovine, or porcine patients. Others offer mixed practice services for both large and small animals. Outside of private practice, vets also find work as educators, pharmaceutical sales representatives, military veterinarians, government meat inspectors, and research scientists. All large animal veterinarians graduate with a Doctor of Veterinary Medicine degree. The DVM program is a rigorous course of study that covers all aspects of health care for both small and large animal species. Upon graduation, all vets must take and pass the North American Veterinary Licensing Exam (NAVLE) to gain their credentials to practice medicine. 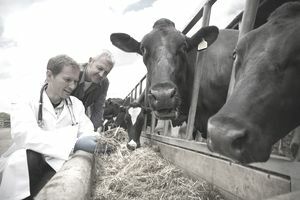 Large animal veterinarians usually make up the smallest percentage of graduates of veterinary schools. The American Veterinary Medical Association is one of the most prominent veterinary organizations, representing more than 80,000 practitioners. Other groups for large animal practitioners include the American Association of Bovine Practitioners (AABP) and the American Association of Small Ruminant Practitioners (AASRP). Veterinarians who are board certified in a particular specialty area (ophthalmology, oncology, surgery, etc) generally earn significantly higher salaries as a result of their advanced education and experience. According to data from the Bureau of Labor Statistics, the veterinary profession will expand at a rate of 9 percent through 2024. This is faster than the average for all positions considered in their salary survey data. Since most vets choose to go into small animal exclusive practice, there should be a continued need for large animal veterinarians in the marketplace, especially in rural areas.